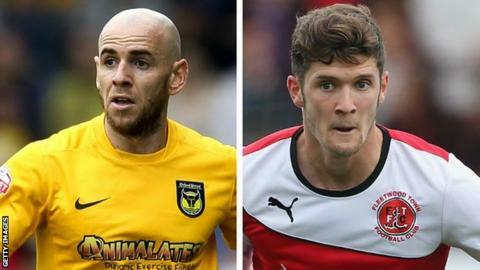 Northampton Town have signed Oxford United full-back Tom Newey and Fleetwood central midfielder Stewart Murdoch on loan until January. Newey, 31, played under Cobblers boss Chris Wilder at Oxford, whilst Murdoch won promotion to League One with the Cod Army last season. Wilder told BBC Radio Northampton: "In the difficult periods of your season, you need experience to shine through. "The good players stand up and be counted and those two certainly will." Full-back Newey counts Leyton Orient, Grimsby, Rotherham and Scunthorpe amongst his former clubs. He will be able to play against Rochdale, another of his old teams, in the Cobblers' FA Cup tie in November. Murdoch, 23, who joined Fleetwood from Falkirk in 2013 having come through the youth system there, is also available for cup duty. "Tom is a character, a voice in the changing room, he's played at the top of this league last year and he gives us that vital experience," said Wilder. "It's been difficult with Evan Horwood [being injured] and Gregor Robertson [played out of position]. We brought Enda Stevens in, who's a young player, but maybe at this period of the season, we need more of a rounded, experienced footballer. "Over the past three or four weeks, you look for reasons [for the defeats] and maybe we haven't had enough competition in key areas. With Lee Collins and Darren Carter coming back [from injury] and these two additions, our group looks a lot stronger."